They require only a single, small incision through which the robotic arms and camera enter. SURGEONS once made incisions large enough to get to a gallbladder or other organs by using conventional tools they held in their own hands. Today, many sit at a computer console instead, guiding robotic arms that enter the patient’s body through small openings not much larger than keyholes. But even this minimally invasive surgery usually requires multiple incisions: one for the camera system showing the way to the surgeon at the console, and others for each of the robotic arms that do the cutting and stitching. Now there are robotic systems — one on the market, others in development — that are even less intrusive. They require only a single, small incision through which the robotic arms and camera enter. This could lead to faster recovery, said Dr. Michael Hsieh, a Stanford professor and a urologist at Lucile Packard Children’s Hospital and Stanford Hospital. “There’s only one wound to heal with this procedure, rather than three,” he said. He will soon have a chance to try out the new method on his patients. Stanford Hospital is buying a system from Intuitive Surgical called Single-Site that requires only a single incision of about one inch. The system, approved by the Food and Drug Administration only for gallbladder removal, is used as an add-on to a basic robotic system from Intuitive, known as the da Vinci Si. The Si costs $1.3 million to $2.2 million, said Angela Wonson, a spokeswoman for Intuitive, based in Sunnyvale, Calif. The Single-Site can add $60,000 or more to the bill, or far less, depending in part on the equipment that hospitals might already have. The East Jefferson General Hospital in Metairie, La., has bought a Single-Site system. Seated at a computer there, Dr. Joseph Uddo Jr. can control the instruments, which can enter the body by way of one incision in the navel. 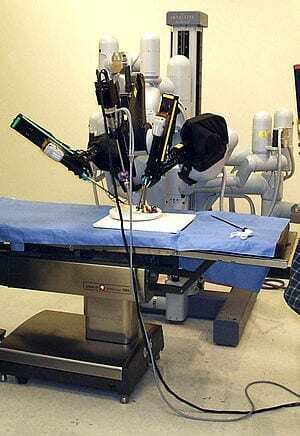 Surgical instruments like scissors are at the ends of the robotic arms. “To change a tool, you take out one instrument and load in another,” he said. ANOTHER surgical robotic system, now in development, enters the body through a remarkably small incision — six-tenths of an inch, or 15 millimeters. The robot was designed by Drs. Dennis Fowler and Peter Allen of Columbia University and Dr. Nabil Simaan of Vanderbilt University. Once inside the body, it unfolds to reveal a camera system and two snakelike arms that perform the surgery. The system has been licensed toTitan Medical in Toronto.